REGION 4— District school boards have approved a new four-year contract for 17 full-time cafeteria workers at the five district schools. The agreement with the worker’s bargaining unit, Council 4 Local 1303-091, was approved by the four district school boards at an Aug. 22 joint meeting. The contract that runs through June 30, 2017 provides step pay increases, but no across-the-board wage hike, for the current year 2013-2014. There will be two percent pay raises, but no step increases, in the second and third years, 2014-2015 and 2015-2016. There would be a 2.215 percent wage increase, but no step increases, in the final year of the agreement, 2016-2017. The cafeteria workers have a much simpler step pay plan than district professionals such as teachers and para-educators, with three steps that are based on years of service. The contract also includes a change in the pension plan for newly hired employees. The existing defined benefits pension plan would continue for all current members of the bargaining unit, but employees hired after July 1,2013 would have a different pension plan that requires a matching contribution from the employee. For health insurance coverage, the co-pay requirement for employees would increase from the previous 15 percent to a 17 percent share of premium costs beginning in the current school year. DEEP RIVER— The board of selectmen this week hired Chris Cope, a former resident state trooper, as the town’s new full-time police officer. The hiring was approved at the board’s regular meeting on Aug. 27. First Selectman Richard Smith said Friday Cope, an East Lyme resident, was one of six finalists interviewed for the new full-time police position. Cope retired last March after 20 years with the Connecticut State Police. At the time of his retirement, Cope was completing about four years of service as the resident state trooper for Deep River. Smith said Cope must complete about two weeks of comparative transfer training at the Connecticut Police Academy in Meriden. The training is required for former state troopers shifting to work in a municipal police department. Smith said Cope is expected to begin patrol duties in Deep River by mid-October. He joins a force that now includes full-time officer Raymond Sypher, and two part-time officers, Smith and Peter Lewis. The town officers serve under the supervision of a resident state trooper. In other business this week, a town meeting Tuesday approved five additional appropriations from the now concluded 2012-2013 budget year that totaled $283,221. Only one resident joined the three selectmen and Town Clerk Amy Winchell at the town meeting to act on the additional; appropriations. The additional appropriations included $34,751 for selectmen/town hall operations, $64,741 for police services, $70,265 for the highway department, $45,401 for parks and recreation, and $60,063 for capital projects, specifically the completion of improvements to town hall. Smith said nearly all of the additional appropriations were covered by grants, additional revenue, and unexpended funds from other budget accounts. Smith had said earlier this month that about $65,000 from the $283,221 total may not be covered by other sources of funding and could require an appropriation from the town’s undesignated fund balance. Smith said Friday he now believes the actual shortfall that would require a transfer from the fund balance will be closer to $40,000. Sign at the entrance of Essex Meadows. Essex Meadows, which is now celebrating its 25th anniversary, will hold three workshops on retirement options this coming fall. The title of the series is “The Future is Yours – Making the Right Retirement Choices,” and will cover various aspects of retirement planning. There are several dates for each workshop. All of the workshops will be held at Essex Meadows, which is located at 30 Bokum Road in Essex. Each workshops begins at 10 a.m. and is followed by lunch. These workshops are open to the public, but space is limited to 10 participants per session. 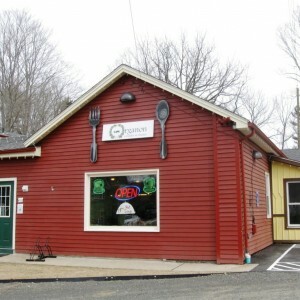 Reservations can be made by contacting Karen Hines at (860) 767-7201, or visiting the website at www.essexmeadows.com. Workshop 1 is titled “Your Future/Your Options” and attempts to define the various residential and medical retirement options. Whether your desire is to remain in your current home, downsize, or explore one of the many retirement options available in Connecticut, this retirement workshop can provide you with planning strategies and the tools you need. Workshop 2 is entitled “Long Term Care Insurance: What you need to know.” This workshop has been designed to review the generic framework of long term care insurance. Policy holders will learn more about their benefits, elimination periods, and other specifics to help them become more comfortable with policy language and procedure. Workshop 3 is titled “I’m Ready, What’s Next?” and has been developed for those who are truly ready to take the next step. This workshop offers guidance if you are at the point where you’ve completed your research, you’ve visited several communities, you’ve found a retirement option that appeals to you and will require a physical move, and now feel almost ready to solidify your retirement plans. This is truly the nuts and bolts blueprint for organizing the next phase of your retirement lifestyle. The Presenters at the workshops are Susan Carpenter, who is the Marketing Director of Essex Meadows, and Maureen Campbell, who is the President of Pearce Plus Senior Services. Ms. Carpenter has over two decades of research and experience in the retirement industry. She is a graduate of the State University of New York at Stony Brook, and she has done graduate work in gerontology and thanatology (the study of death and dying) at the College of New Rochelle. Ms. Campbell brings over 29 years of experience working with families in transition. She is a Certified Relocation Professional and a Global Mobility Specialist from the Worldwide Employees Relocation Council. In 2007 she was recognized as one of the Top 20 Business Women by Business Times Magazine. For more information on the workshops or other special events and lectures, please visit www.essexmeadows.com. 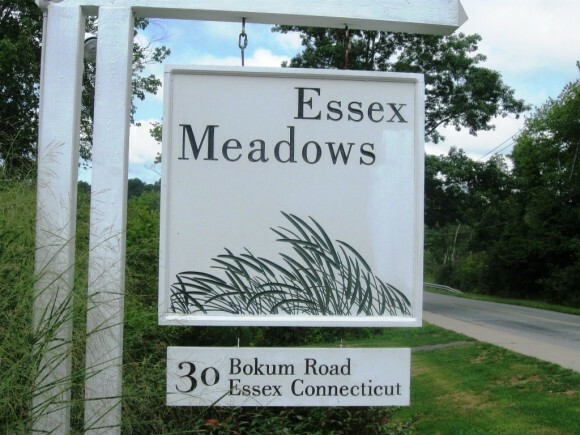 Essex Meadows, where we believe life is anything but retiring. ESSEX— A 23-year-old Westbrook man has been sentenced to six months in jail on charges related to the December 2011 stabbings of four alpacas at the Applesauce Acres farm on Bushy hill Road in the Ivoryton section. Kyle Roscetti received the sentence Thursday at Middletown Superior Court. Roscetti had pled guilty to a charge of cruelty to animals and violation of probation. Middlesex superior Court Judge David Gold sentenced Roscetti to one year in prison, suspended after six months served, and two years of probation. He will also be required to make restitution to the owners of the alpacas and undergo a mental health evaluation. The judge agreed to delay the start of the sentence for a medical treatment, with Roscetti required to report to the Department of Corrections on Sept. 13. The alpaca killings that were discovered on Dec. 23, 2011 shocked area animal lovers. A state police investigation in April 2012 resulted in the arrest of Roscetti and Shawn Malcarne, 25, of Deep River. Malcarne was granted accelerated rehabilitation in court last year, receiving two years probation with a requirement that he complete 100 hours of community service. REGION 4— Region 4 schools open Thursday for the 2013-2014 academic year, with expanded technology in the classrooms, a new teacher evaluation process, and cameras on all school buses among the enhancements awaiting students in the new year. About 2,100 students in grades kindergarten through 12 are expected to return to the five district schools, with teachers and other district staff returning on Monday to prepare for the opening day. Superintendent of Schools Ruth Levy said Friday that technology will expend throughout the district, particularly in the primary grades, with about 125 iPads purchased for use in various classrooms. Elementary school students will learn additional keyboarding skills as the year progresses. Levy said the district will begin implementing a new teacher evaluation plan, a step that is linked to instruction for new Common Core State Standards that were required as part of the statewide education reform legislation approved in 2012. Levy said video cameras will now be in place on all 17 of the First Student Inc. buses that transport district students. In recent years, three cameras have been rotated among the buses over the course of a year. There have also been improvements to school security in response to the Newtown elementary school murders last December. Visitors will be buzzed in to all schools, and will be required to leave a drivers license or some other identification with the office during their visit. Staff, substitute teachers, and visitors will all have color coded ID badges while in the buildings during school hours. The school year begins with 16 new full and part-time professional staff. Tyson Stoddard, who started working in the district in July, is the new supervisor of pupil services, a new position assisting Director of Pupil Services Tracy Johnston is coordinating special education services in the five schools. Stoddard had worked previously as special education coordinator for the Plymouth school system. New teachers at Valley Regional High School include Kevin Woods-special education, Sarah Rubelmann-special education, Elizabeth Nischan-English, Amy Farotti-science, para-educator Nancylynn Maselli, and Lori Sullivan as a half-time art teacher. Catherine Vashel is the new math tutor at John Winthrop Middle School. New positions funded through the supervision district include Christine Corcoran as a new half-time instrumental music teacher, and Susan Alfiero-Bavasso as a four-tenths time speech and language pathology therapist. Kirsten Reynolds is the new network technician at Essex Elementary School, with Katie Duncan in a new one-third time para-educator position. Caitlyn Hardy is a new teacher and Julie Papalia a new long-term substitute at Deep River Elementary School. Pamela Baclaski is the new remedial reading teacher and Marijane Mantie is returning as a teacher at Chester Elementary School. Mantie had worked at the Chester school in the 2011-2012 school year, but was laid off last year due to a drop in student enrollment. She has been rehired to replace a retired teacher. Grade assignments for the elementary school teachers are still being determined. While schools open Thursday, there will be no classes on Thursday Sept. 5 for the Rosh Hashanah Jewish holiday. Students will have Oct. 14, Columbus Day, off but school will be in session for district staff as a professional development day. Schools will be open on Veterans Day, Nov. 11, with special programs on veterans to be presented during the school day. This is a change from last year, when school was in session for Columbus Day and closed on Veterans Day. LYME — The U.S. Fish and Wildlife Service recently partnered with The Nature Conservancy to add 66 acres of tidal marsh and coastal lands along Whalebone Cove in Lyme to the Silvio O. Conte National Fish and Wildlife Refuge. Announced today, this expansion of the refuge includes the purchase of 26 acres from a private landowner, along with a donation of four previously conserved properties totaling 40 acres, from the Conservancy to the Service. Together, these parcels establish the new Whalebone Cove Division of the refuge. The Nature Conservancy negotiated the new 26-acre property purchase on behalf of the Service and made option payments over 2 ½ years to allow time for the Service to secure funding for the purchase. The newly protected property contains approximately 2,000 feet of Connecticut River frontage and forms the southern entrance to Whalebone Cove. It features extensive high and low tidal marsh communities; steep, wooded slopes; an upland kettle-hole wetland complex; floodplain forest; upland meadows; and mature forest. Whalebone Cove features exemplary tidal marshes that host one of the largest stands of wild rice in Connecticut. It is an important wintering area for bald eagles and black ducks and a significant feeding area for migratory waterfowl. Just south of Gillette Castle State Park in Lyme, Whalebone Cove is one of the most undisturbed and biologically significant freshwater tidal marshes on the Connecticut River. The Cove has been a longtime conservation priority of The Nature Conservancy as well as a “special focus area” for the Conte Refuge. The donated acreage was originally conserved by The Nature Conservancy more than a decade ago. “Today, we celebrate the permanent protection from development of these precious natural areas,” said Nathan Frohling, the Conservancy’s director of Connecticut coastal and marine initiatives. “The new acquisition, combined with the parcels the Conservancy is now donating, will build on a legacy of conservation here and in the Lower Connecticut River. The Conte Refuge represents an important new and trusted partner in achieving a larger conservation vision for Whalebone Cove. The Service’s role was key to making the purchase possible, and with it 80 percent of this freshwater tidal marsh site is now protected,” Frohling said. Connecticut leaders this week expressed their support for the refuge. Silvio O. Conte National Fish and Wildlife Refuge was established to conserve native plants, animals and their habitats in the 7.2 million acre Connecticut River watershed that stretches across four states. It is the only refuge in the country dedicated to a river’s entire watershed. The refuge works to protect land, form partnerships with citizens to foster conservation efforts, educate the public, and pass on the importance of the watershed to future generations. The Nature Conservancy is the leading conservation organization working around the world to protect ecologically important lands and waters for nature and people. To date, the Conservancy and its more than one million members have been responsible for the protection of more than 18 million acres in the United States and have helped preserve more than 117 million acres in Latin America, the Caribbean, Asia and the Pacific. Visit The Nature Conservancy on the Web at www.nature.org/connecticut. DEEP RIVER— An Aug. 27 town meeting will be asked to approve five over expenditures in the 2012-2013 town budget that total a combined $283,221, though nearly all of the total is expected to be covered by additional revenue, reimbursements, or unexpended funds from other accounts in the town budget. The town meeting convenes at 7 p.m. in town hall. The expenditures were approved for referral to a town meeting at an Aug. 13 joint meeting of the board of selectmen and board of finance. The over expenditures that require approval from voters at a town meeting include $34,751 from the selectmen/town hall operations section of the budget, $64,741 for police protection, $78,265 for the highway department, $45,401 for parks and recreation, and $60,063 for general government capital expenditures. First Selectman Richard Smith said Tuesday the selectmen/town hall operations overrun resulted from unexpected expenses for engineering services and supplies and equipment. Smith said the police overrun includes funding for the planned hiring of a new full-time police officer and over expenditures for special police services such as traffic control. He said the parks and recreation overrun developed from additional repairs and upgrades to structures at Devitt’s Field and Plattwood Park. Smith said the $60,063 for capital expenditures includes $49,543 that was expended as part of the now completed town hall renovation project. Smith said the $78,265 over run for the highway department was largely the result of expenses related to Storm Sandy last October and snow removal from the Feb. 8 blizzard. “Our budgets are very lean and the two big storms really hurt us,” he said. Smith said nearly all of the over expenditures would be offset and covered by additional revenue, reimbursements, and unexpended funds from other budget accounts. But Smith acknowledged as much as $65,000 of the total may not be covered, depending on the outcome of final state reimbursements for the now completed Village Street bridge reconstruction project. “I’m pretty sure it will be close to a wash and the $65,000 would be a worst case scenario,” he said. Any final 2012-2013 budget overrun that is not covered by additional funding would require an appropriation from the town’s undesignated fund balance. Essex — Gregory R. Shook, President & CEO of Essex Savings Bank, is pleased to announce the addition of Robert B. Benoit as Vice President, Commercial Loan Officer. Robert’s career spans over forty years in small business lending coupled with management experience. He most recently worked 8 years for The Bank of Southern Connecticut where he served as Senior Commercial Lending Officer and Loan Workout Officer. He also brings experience lending in conjunction with the various US SBA loan programs. Robert has also worked at other financial institutions in both Connecticut and New York, notably The Chase Manhattan Bank and Rabobank Nederland. Robert is a graduate of Dartmouth College and served in the U.S. Army Corps of Engineers. He resides in Milford with his wife Charlene. CHESTER— The planning and zoning commission has closed the public hearing on a special permit application for a new pizza restaurant at 69 Main St. in the downtown village. In other business at the Aug. 8 meeting, the panel approved a special permit for a newly constructed seasonal restaurant at the 72 Railroad Avenue property of the Chester Point Marina. The proposed new pizza restaurant would be run by Jonathan Rapp, owner of the River Tavern restaurant at 23 Main St. The three-story building at 69 Main St. is owned by local resident Jonathan Schroder, who purchased the property from the town several years ago. The town had purchased the property, which abuts the former town hall site, in the 1990s for a planned expansion of town hall in the downtown village that was later abandoned in favor of the current town hall at 203 Middlesex Avenue (Route 154). The proposed 35-seat restaurant would serve pizza, salads, gelato, and beer, with seasonal outdoor seating. The restaurant hours would be daily from 5 to 11 p.m. The proposed restaurant drew questions, but little specific opposition, at the Aug. 8 hearing. But one nearby resident, Jean Davies of 73 Main St., opposed the application. She called on the commission to limit outdoor seating and take-out service for the pizza. The commission has until early October to act on the permit application, with discussion expected at the panel’s Sept. 12 meeting. The commission also approved the new seasonal restaurant at the Chester Point Marina that was the subject of a public hearing in July. The restaurant, which would operate from April to October, would be part of a new 5,561-square-foot building. About 2,650 square-feet would be restaurant space, with the remainder containing marina offices and a display area. An existing building that also had a seasonal restaurant would be demolished. The marina on the Connecticut River contains docking slips for 135 boats. ESSEX— The board of selectmen is considering a new proposed blight ordinance that would be triggered if a structure has been vacant and unoccupied for more than 30 days. Selectmen received a draft copy of the ordinance last week, with the board expected to discuss the ordinance further at a Sept. 18 meeting. The ordinance drafted by town attorney David Roylston specifies that the town has the authority to “define, prohibit, and abate blighted premises”, to “protect, preserve, and promote public health, safety, and welfare and to preserve and protect property values within the town.” The ordinance defines various characteristics of a blighted property, including violations of the public health code, fire hazards unregistered and inoperable motor vehicles, dad or damaged trees, and accumulated debris. But under the new version of the ordinance, enforcement measures by the town would not occur unless and until a structure has remained vacant and unoccupied for more than 30 days. This provision was not included in a proposed blight ordinance the board of selectmen presented at a public hearing in 2011, but never acted upon. At the time there were a handful of unsightly and unoccupied structures in all three villages, Essex, Centerbrook, and Ivoryton. Some of these structures have been restored or demolished over the past two years. A remaining vacant, fire damaged, and unsightly property at 63 North Main St. in Essex has sparked new discussions of a possible blight ordinance in recent months. First Selectman Norman noted this week that he had opposed the initial version of a blight ordinance that was discussed while he was on the board of selectmen in 2011. Needleman said he was then, and remains, reluctant to get the town involved in “neighbor on neighbor” disputes over conditions on specific properties. Needleman said he asked Roylston to make vacancy the key provision that would trigger town action on a blighted property or structure. The proposed ordinance calls for establishment of a three-member “anti-blight board” that would receive and review complaints about blighted properties. The board would include the town’s finance director, tax assessor, and a code enforcement official. If blighted conditions are present on a property, beginning with the more than 30 days vacancy, the board could issue a notice of violation to a property owner. The property owner, which could include a bank or financial institution, would have between 15 to 60 days to abate the blight conditions. The property owner would also have 15 days to appeal a notice of violation to the board of selectmen. If a vote of the board of selectmen confirms that blight conditions are present, the ordinance would authorize the town to take legal action against a property owner, impose fines, and allow persons working for or hired by the town to take steps to remediate a blight condition. The ordinance would authorize the town to impose a tax lien on the property to recover the cost of any required remediation measures. Needleman said the board of selectmen could decide at the Sept. 18 meeting whether to send the draft ordinance to a public hearing. Depending on input received from residents at the hearing, the ordinance, or a revised version of it, could be presented to voters for approval at a town meeting later this year. The reason that Lorenz has been able to play this role is that he is the co-owner of forty acres of land that abut the Preserve land. This gives him legal “standing” in court to assert that his personal property would be damaged by the various schemes put forward by the would-be private developers of the Preserve. Lorenz is also a professional photographer, and to mark the recent agreement, whereby the Trust for Public Land will organized the purchase of the 1,000 acre Preserve property from River Sound Development, LLC, upon payment of $10-$11 million, he has made available for publication a striking aerial photograph of the undeveloped, forested Preserve. 1) Very clearly, running along the bottom of the photograph one can see Route 153, sometimes called Plains Road and Westbrook Road. The vacant, forested land pictured above Route 153 marks the northern boundary of the Preserve. 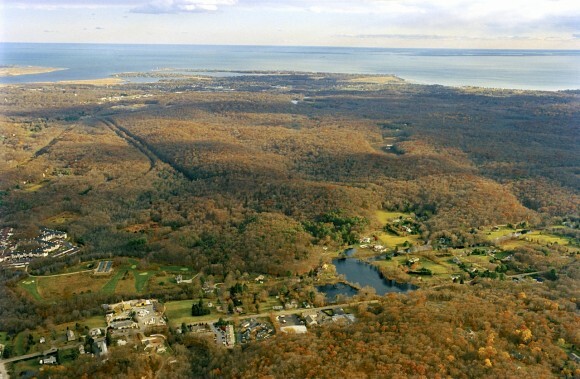 2) As for the southern boundary of the Preserve property, it runs at the top of the photo, just below visible line developed property along the shoreline of Long Island Sound. 3) Very clear as well at the top left of the photo is the mouth of the Connecticut River, as flows into Long Island Sound. 4) Finally, in the midst of the forested land in the photo, there are two parallel lines, which are abandoned railroad tracks. The Rotary Club of Chester is proud to announce the recipients of its 2013 Citizenship Award. Each year this award is given in the form of a scholarship to two graduating high school seniors who are residents of the Town of Chester. This year’s awards were won by Anna D’Agostino, the daughter of Karen and Edward D’Agostino, and Margaret (Maggie) Calamari, the daughter of Kronkanok Ratanasaka and Paul Calamari. Each recipient was presented with a $2,000 scholarship at Valley Regional High School’s Senior Awards Night held on June 5, 2013. Both Anna and Maggie have displayed the principles and values of Rotary in their daily activities. These include community involvement, scholastic achievement and athletic achievement that exemplifies Rotary’s “Service Above Self” maxim. 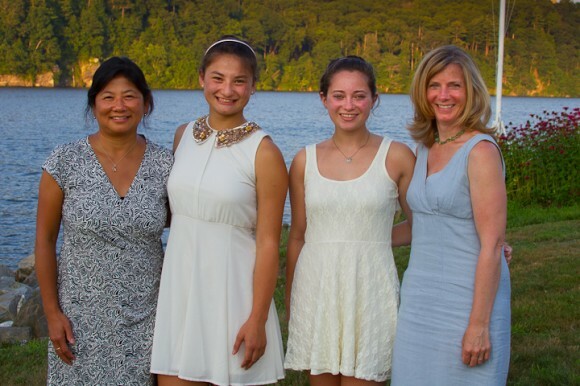 The Chester Rotary Club hosted a dinner on July 17, 2013 for Anna, Maggie and their families to celebrate the accomplishments of the two exceptional young women. Anna will attend Fordham University based in New York City and Maggie will be attending Drexel University located in Philadelphia. The Rotary Club of Chester is pleased to recognize these two outstanding students. The Rotary Club of Chester is a 501c(3) not for profit organization. We encourage you to visit our website at www.chesterrotary.org for more information regarding our club and it’s fund raising efforts, updates for our upcoming events and links to Rotary International. ESSEX— The zoning commission will hold a public hearing Monday on a proposed nail salon in vacant space at the commercial building at 31-33 Main St. in the Centerbrook section. The hearing convenes at 7 p.m. in town hall. Maria Malla of Waterbury is seeking approval for a nail salon that would have four chairs for manicures and four chairs for pedicures. The proposed salon would be open each day from 9 a.m to 7 p.m. The space on the west side of the commercial building at 31-33 Main St. was previously occupied by a medical equipment supply business, but has been vacant for more than two years. ESSEX-— The bids have come in high for the Essex Town Hall Civic Campus project that is to be funded by a $471,500 state Small Town Economic Assistance Program (STEAP) grant. Four bids for the project were opened on Aug. 8. All of the bids exceeded the amount of the grant the town was awarded late last year. The bids ranged from a price of $594,832 from B&W Paving of Oakdale to a high bid of $795,971 from Running Brook Construction of Killingworth. The second lowest price was a bid of $638,113 from Xenelis Construction Inc. of Middlefield, a company that has done work for the town previously. The project calls for repaving and expanding of the town hall parking lot, new tennis courts and a new handicapped accessible play scape for the abutting Grove Street Park. 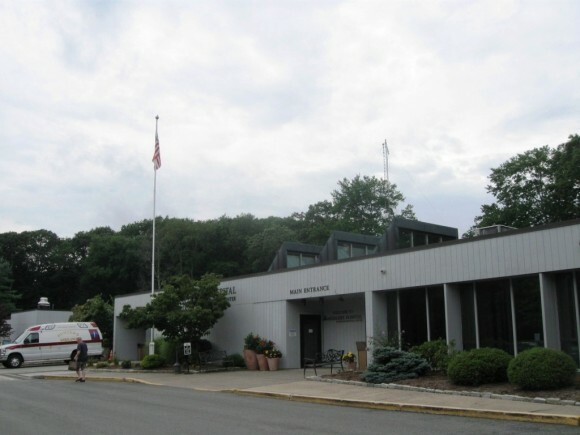 There would also be new crosswalks and sidewalks and other improvements to Grove Street intended to enhance the connections between town hall and the Essex Library, which has its main entrance on the other side of Grove Street. First Selectman Norman Needleman said Tuesday he is optimistic some components of the project can be adjusted to establish a final price that is more in line with the grant amount. “We think we can come in close,” he said. Needleman noted that while the bid specifications includes extensive paving work, the town can secure a lower price for paving materials through a state price contract that is available to cities and towns. He said some of the work could be done by the town public works crew, allowing for removal of some project components from the bid price. Needleman said he would work with Public Works Director David Caroline to negotiate possible changes to the bids, with a focus on the two lowest bidders, B&W Paving and Xenelis Construction. Needleman said he is hopeful a contract could be awarded early next month to allow construction to begin this fall for completion before the start of the winter season . Prominent New York City New York City developer, Frank J. Sciame, Jr., has sold the first lot on his 11.4 acre development site at Foxboro Point in Essex. 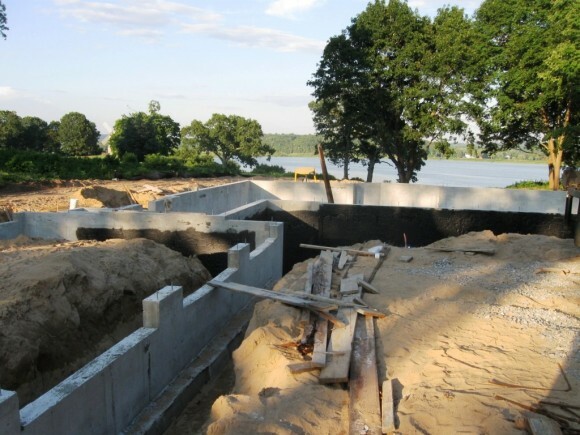 The lot is on the last significant, large open space on the waterfront in Essex. The price paid for this Lot 1 was $1,125,000 for the land alone. The cost of a house at 19 River View Street will be additional. Sciame’s Foxboro Point development property consists of eight building lots, which curve around Foxboro Point, facing the waters of North Cove. The centerpiece of the development is the Croft Mansion. 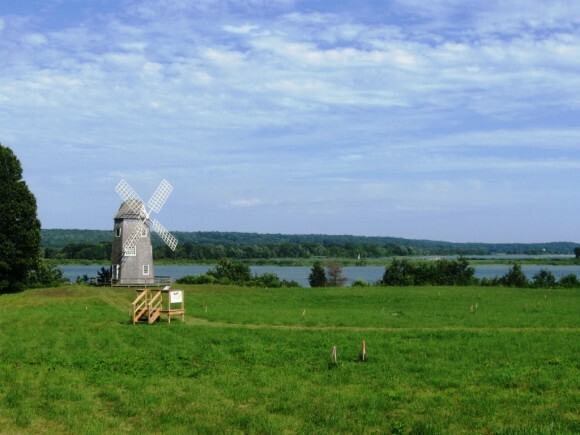 Among the other lots is for sale is the one that contains Foxboro Point’s iconic windmill. In addition to the sale of Lot 1, which is located at the far right end of the development site facing North Cove, the developer is offering Lot 2 as a package consisting of a “build-to-suit” house and the grounds around it. 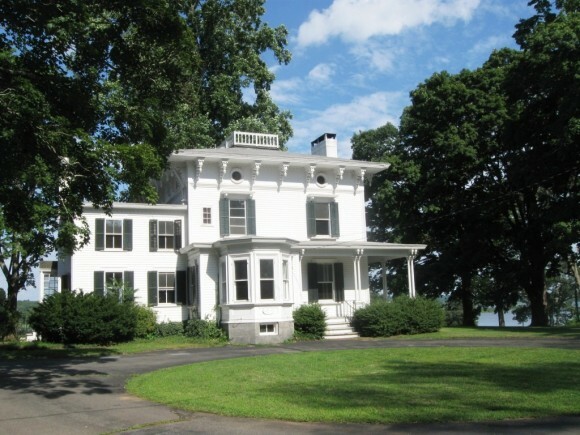 The estimated sale price is $3,000,000 for the house and grounds at 21 River View Street. Developer Sciame has also embarked on a total renovation of the Croft Mansion, which has largest lot in the development with 1.5 acres. The renovations of Croft Mansion will include a new, open floor plan featuring a new open kitchen and open living and dining areas as well. In addition, the grand staircase of the mansion will be enlarged to permit sun light to filter down from the third floor to the first floor. Other renovations will include: 1) the installation of new mechanical systems, 2) new windows throughout, 3) new bathrooms, and 4) a new state of the art kitchen with all new appliances. The asking price for the renovated Croft Mansion and the land, which has sweeping views of the waters of North Cove, will be in the neighborhood of $3,500,000. In addition, there is an option of adding an additional building lot that would accommodate a swimming pool, which would raise the price to $4,900,000. Finally, Sciame’s plans for Foxboro Point will include putting the Windmill site up for sale. The developer says that the site is large enough to accommodate a livable residence. Sciame asking price for both the windmill and its grounds is $1,950,000. During the lengthy approval process before the Essex Planning Commission, many Essex residents expressed their approval of the new development at Foxboro Point, noting that it would add new real estate taxes to the Town of Essex. However, one Essex resident, William Reichenbach, who lives on New City Street in Essex, charged that the Commission had neglected the town’s own open space and public access regulations in approving the application. The Commission did not accept this argument. There was also a brief discussion by the Commission about requiring the developer to build a pedestrian path, running from Foxboro Road down to the waters of North Cove. However, a view easement was approved from the road to the water instead. The vote by Planning Commission members to approve the project was by a secret ballot, which appeared to violate the state’s Open Meeting Law. However, an objection to the secret vote was not made in a timely manner, so the vote was valid. Summer produce is here and with it come many requests for how to use up all this gorgeous fruit, vegetables and herbs. Amanda Cushman is back with some mouth-watering recipes for our readers. Place the garlic in a processor and chop finely. Add the basil, feta, nuts and pepper and blend well. Add a small amount of water to produce a smooth sauce. Transfer to a container and freeze or serve at room temperature. Heat the oil in a medium saucepan and sauté the onion and garlic until softened about 5 to 6 minutes. Add salt, pepper, basil, tomatoes, wine and sugar or carrots and cook over low heat until thickened slightly about 45 minutes. Season to taste and puree if desired. Freeze in plastic containers or use on pasta, grilled fish, chicken or as a sauce for vegetables. 1. Peel the papayas and remove seeds, finely dice. Combine the papaya and remaining ingredients in a medium bowl. Stir and taste for seasoning. Cover and chill until ready to serve. 1 Place the zucchini in a colander and toss with 2 tsp. of salt. Place over a plate and weigh down with a heavy can, drain for 1 hour or overnight in the refrigerator. Squeeze out all the excess water. 2 Add the zucchini to a medium bowl with the scallions, cheese, breadcrumbs, mint, parsley, egg and fresh pepper. Using slightly moistened hands, form the zucchini mixture into 12 balls. Flatten them to make a ¾ inch patty. Test one out in a small skillet for seasoning. Re-season with salt and pepper if needed. 3 Heat a 2 1/2 -inches of oil in a medium saucepan and fry the patties until golden on both sides about 3 minutes per side. Transfer to paper towels to drain and sprinkle with salt. 4 Meanwhile, combine the yogurt, lemon, garlic, mint, salt and pepper in a small bowl. Stir and taste for seasoning. Serve the patties warm or room temperature with the yogurt sauce. 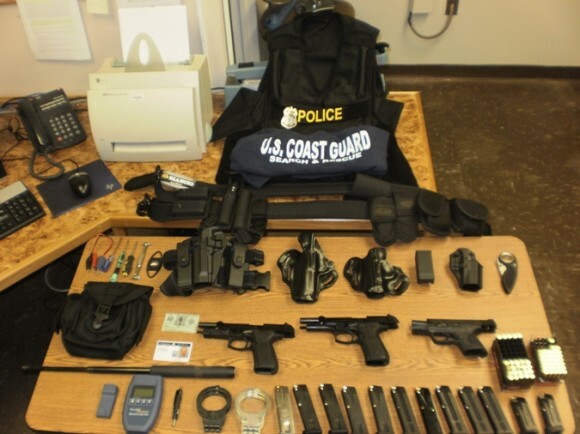 Weapons, ammunition and associated paraphernalia found and confiscated by the Old Lyme Police during the arrest of Bruce Browne at Point O’ Woods yesterday. On Thursday evening at 6:23 p.m., Troop F personnel and Old Lyme Police Officers responded to the Point O’ Woods beach community in Old Lyme. A phone call had been received from a resident reporting a white male wearing military type clothing was walking on Sea View Dr. with a gun. The caller also reported that this same male was seen early on today’s date operating what she described as a “police type vehicle”. Responding Troopers and Officers located a 2004 blue Crown Victoria bearing CT. Reg. 684-ZNF at 32 Sea View Dr. This vehicle was equipped with what appeared to be a disc and antennas mounted on the trunk and equipped with “hide-away” lights. Upon speaking with several occupants at the residence, Bruce W. Browne, age 46, from Wolcott, Conn., stated that he was the registered owner of the vehicle. Browne was wearing blue BDU type pants and upon being questioned about his early whereabouts, Browne admitted to walking on Sea View Dr wearing a black nylon gun belt with a loaded 9mm pistol in a holster on the belt. Located in his vehicle and in plain view were three loaded 9mm handguns, a black nylon duty belt with two sets of handcuffs, an expandable Asp, 12 fully loaded magazines with a total of 101 hollow point and 102 ball 9mm bullets. Browne also had a black tactical bullet proof vest with the word POLICE embroidered on the front and back. Also attached to the front of the vest was a silver metal TSA badge. Further investigation revealed that Browne had commandeered a boat earlier in the day by identifying himself as a “Police/Coast Guard” official. Browne stopped three separate vessels off the shore of Point O Woods. During these vessel stops Browne was asking boaters for their registrations and boater safety certificates. Browne also had an expired Coast Guard identification card belonging to him back when he was a reserve member of the Coast Guard. TSA and US Coast Guard officials were contacted and upon researching their personnel records, it was determined that Browne is not affiliated with either of these agencies. US Coast Guard Officials will be conducting a follow up investigation on 08-09-13 with regards to similar incidents that they are currently investigating. Browne was arrested and charged with impersonating a police officer, breach of peace, interfering with a police officer and possession of a dangerous weapon in a motor vehicle. Browne was released on a $50,000.00 bond and will appear at court in New London on Aug. 22. As a Chester resident, former P & Z Commissioner, and owner of property abutting the Organon Market on Route 154, I have been following Charles Stannard’s coverage of the story quite closely. I have found his coverage to be an evenhanded and accurate depiction of the complicated issues that have surrounded the project for the past three years. I would, however, like to comment on a couple points made in his article entitled: Organon Market to Close for Remodeling – Permit Application to Chester P&Z. First, Mr. Stannard writes that (market owner) “Peter Kehayias also acknowledged the market at 56 Middlesex Avenue, also known as Route 154, would probably never reopen if the commission does not approve some revisions to conditions that the panel imposed when it approved a special permit for the market in September 2011”. It is important to understand that P&Z did not “impose” any conditions. Rather, the special permit was negotiated by Mr. Kehayias and his attorney(s) with input from the commission. In fact, many of the conditions that Mr. Kehayias is now trying to alter were authored by Mr. Kehayias himself. They were presented for the record during the public hearings and are memorialized in the meeting minutes and in his application. These issues include the type and amount of allowable exterior signage and Mr. Kehayias’ agreement to forgo seating and the on-site consumption of food. Mr. Stannard quotes Mr. Kehayias as saying “ The market should be allowed to run as a market…..I can’t be looking over my shoulder all the time”. Mr. Kehayias seems eager to lay the Market’s problems at the feet of his neighbors, the Zoning Enforcement Officer, and P&Z. The truth is that P&Z did not write the statutes which he feels have limited his operation. Local Town commissions are mandated to follow State Statute on Zoning (and other) matters, and the Town would be terribly, as lawyers would say, “ exposed” if they were to approve activity forbidden by the State. Mr. Kehayias purchased a property in a residential zone which, by definition, restricts many types of commercial activity. This is not opinion, this is law. During the application and construction process, Mr. Kehayias enjoyed the counsel of architects, assorted licensed contractors, traffic engineers, and at least (by my count) four different attorneys. It is difficult for many of us to fathom how he can now suggest that the Town is restricting his activities and not allowing him to succeed. The application process for the market was extremely long and detailed, with considerable discussion and negotiation on everything from the menu and operating hours to the noise generated by the kitchen equipment. The process was completely transparent, and we all should have known what to expect and what rules we’d have to play by. ESSEX— The board of selectmen Wednesday approved a new annual fee for residents bringing their own trash to the solid waste transfer station. The new $125 fee, along with higher fees for disposal of other items, was approved on a unanimous vote. The new fee structure that was developed by the town’s appointed sanitary waste commission is effective Jan. 1, 2014. First Selectman Norman Needleman said the purpose of the new fee system is to remove cash transactions from the operation of the solid waste compactor site, located off Route 154 near Route 9 exit 4. Residents currently pay $3 per bag for disposal of household trash, handing the money to an attendant or paying under an honor system if no town employee is at the site. Needleman said the new annual fee of $125 for a resident user sticker does not represent a significant cost increase for residents using the site, a group that excludes residents that pay a commercial trash hauler for curbside pickup. Senior citizens over age 65 would pay a discounted sticker fee of $75. Occasional users of the site could purchase five user tickets for $25. The package of fees approved Wednesday also includes higher fees for disposal of tires, stuffed furniture, mattresses, brush, and demolition materials. There will be no charge for disposal of recyclables, including bottles, cans, cardboard, and newspapers. The fees for tires on the rim would increase from $5 to $10, but remain at $5 for junk tires taken off the metal rim. The fee for disposal of junk stuffed furniture would increase from the current $7 to $10, with a $20 fee for disposal of mattresses. The fee for disposal of demolition materials would increase from the current $15 to $20 per cubic yard, and from $7.50 to $10 for a half cubic yard. Needleman said the town was spending almost double for disposal of demolition materials than was being generated in revenue from the current fees. The fee for disposal of brush would be $10 per cubic yard, though there would be no charge for residents bring smaller bags of brush to the site. As part of the removal of cash transactions, residents would be required to pay the other disposal fees by check or credit card. In other business, Needleman announced the town is seeking a volunteer to serve as veterans service contact representative. The new position was established under a newly effective state law, and is comparable to the long-standing position of municipal agent for the aging. The contact representative would assist in putting local veterans in touch with available services. Needleman said he is hoping an Essex veteran will volunteer for the position. Finishing a painting of Bar Harbor, Maine. Ships in the cove will be added. 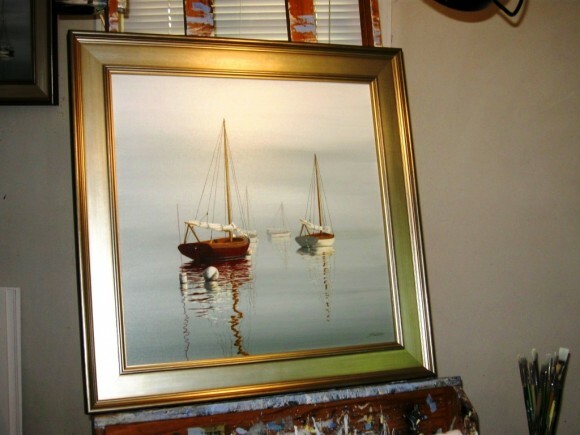 Jeffrey Sabol is a nationally recognized painter of maritime subjects. 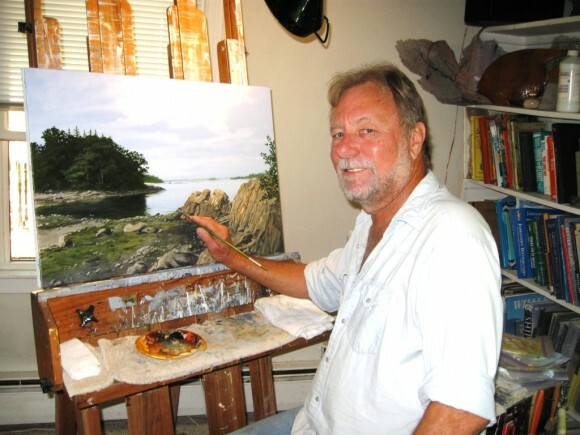 As a Signature Member of the prestigious American Society of Marine Artists, he has exhibited in Museum Shows around the country, sponsored by the Society. 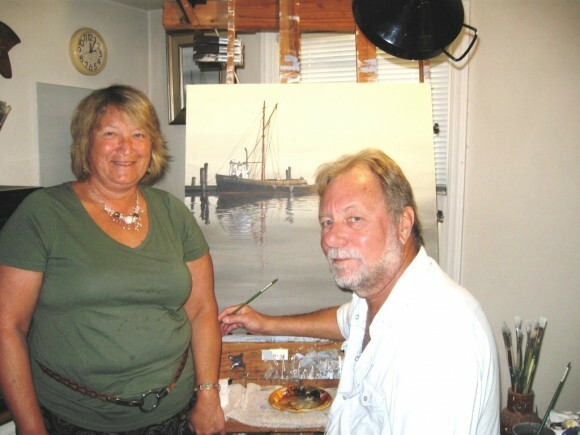 His paintings have been featured at leading maritime art galleries, including Art of the Sea Gallery in South Thomaston, Maine; Art Expo in New York City; Sheldon Fine Arts Gallery in Newport, RI, and closer to home, the Maritime Gallery at Mystic Seaport. Sabol’s striking portrayals of sailboats, quietly anchored amidst shimmering shadows of light, can be viewed, and purchased, at any of these locations in addition to Fresh Ayer Gallery in Old Lyme, adjacent to the Hideaway Restaurant; Art Essex on Main Street in Essex, and Blue Moon Artisans in Guilford. 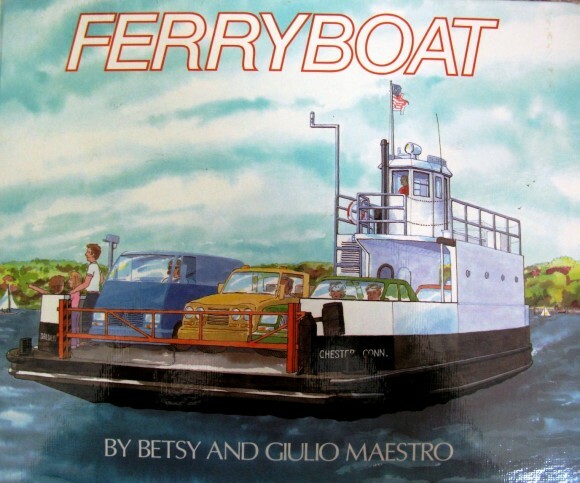 The artist also periodically shows his superb nautical paintings by appointment at his studio. Visit his website: www.jeffreysabol.com for further information. Interestingly, the previous owner of Sabol’s house was a fisherman who sold “live” lobsters out the back, which in a sense is nautical too! The use of quick drying acrylic paint is now basic to Sabol’s painting process. Quick drying acrylic paint allows him to add layer after of layer of clear and tinted surfaces to his paintings. These surfaces, one on top of the other, enhance the paintings, giving them a greater depth and sheen. Sabol points out that in painting a group of ships at anchor, a favorite topic of his, that there are both positive and negative spaces in the painting. “The positive spaces are those which hold the subject of the picture,” such as ships at anchor, he says. The negative spaces are the empty parts of the painting, above and below the ships, which can be used to enhance and heighten the items in the positive spaces. Glimmering light, flickering over waves below the ships’ hulls, is an example of the use of negative space, contributing to the positive space of the ships themselves. As Sabol puts it, “The negative space in a painting is used to bring out the positive space, which is the subject of the picture.” He also says, “I concentrate on reflections in my paintings,” which of course fill in the negative spaces of his paintings. Mr. Sabol did not start out as maritime painter. After abandoning an effort to become an architect “because there was just too much sitting,” he made his living as a commercial fisherman and long liner. After one too many storms at sea, he decided it was safer to ‘paint’ the sea, rather than ‘fish’ it. He is grateful now for his steady position on his artist’s stool doing what he loves most. Jeff gets much of his inspiration sailing with his wife in the coastal waters of New England on their Islander sailboat, which they keep in Noank. 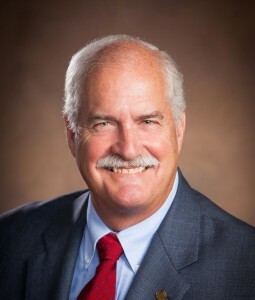 First Selectman Edmund Meehan said the volunteer Main Street Committee, which is coordinating the long-planned project, recommended proceeding with the initial, eastern, phase immediately after voters approved a long-range plan for the project at a July 23 town meeting. The full project calls for a complete reconstruction of Main Street in the downtown village, including improvements to two parking lots. But subsequent phases of the project would not begin until after the state Department of Transportation completes a replacement of the Main Street bridge in 2016. Meehan said the engineering firm would be asked to complete bid-ready plans for reconstruction of the eastern segment of Main Street, including a detailed cost estimate. He said a firm could be hired by October, with the design plan to be completed by the end of the year. Meehan said the project could be put out to bid by March, with construction to be underway during the spring and summer of 2014. The town currently has about $800,000 in hand for the project through a combination of town funds and state grant funds. Meehan said an expenditure of funds for the “Main Street East” project would require approval from voters at a town meeting. 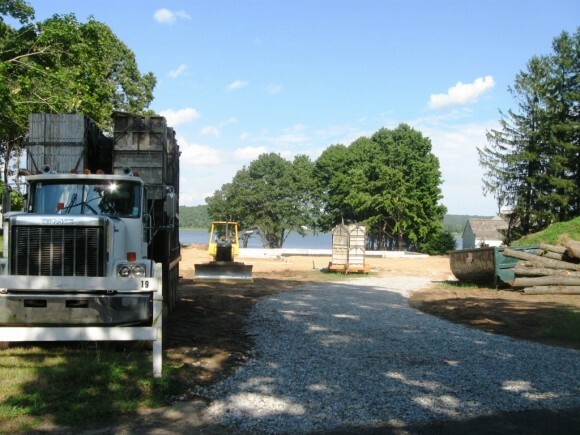 DEEP RIVER— The town has received a $400,000 state grant for improvements to Plattwood Park, the town’s major recreation area located off Route 80. The grant, provided under the Small Town Economic Assistance Program (STEAP), was announced last week with a visit to town by Lt. Governor Nancy Wyman. The 23-acre park, which includes a former sand and gravel quarry pond, was acquired by the town in 1981 and improved for recreational uses in subsequent years. The 1981 purchase, for a price of $75,000, also included a separate 25-acre area to the west that was sold for development as the Plattwood Industrial Park. The grant will fund several improvements at the park, including a new and larger pavilion with handicapped accessible bathroom facilities. The grant will also pay for a new athletics field and circular jogging/walking trail on the eastern section of the park. There would also be a new, handicapped accessible walking trail through a wooded area on the southern side of the park. Along with a public swimming area in the former quarry pond, the park currently includes a picnic area with charcoal grills and tables, a basketball court, a skateboarding park, and a paved parking area. The park is open to town residents free of charge, while non-residents pay a $20 per vehicle parking fee to use the park. 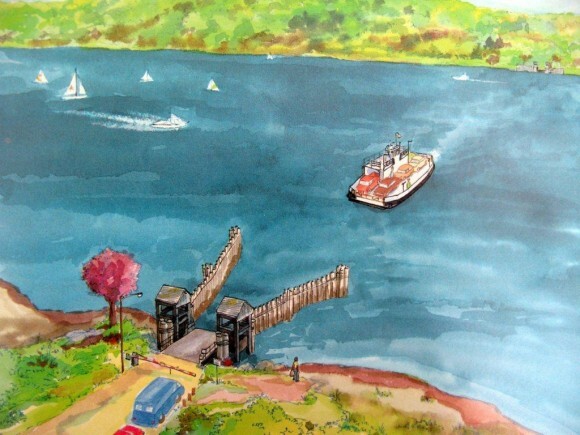 Construction for the grant-funded improvements is expected to begin in 2014. ESSEX— State police Monday recovered a man’s body from the South Cove of the Connecticut River after a search for a missing New York man that began Sunday evening. Police had not formally identified the body as of Monday afternoon, though the search has been discontinued for Richard Cianflone, 29, of Vahalla, N.Y.
Cianflone had been visiting Essex over the weekend with friends, attending the Essex Lions Club Lobster Festival that was held Saturday at the Main Street Park. Cianflone later visited the Griswold Inn, and was last seen late Saturday night. Friends reported him missing Sunday, leading police to begin a search Sunday evening with tracker dogs and a team of divers. Police said Cianflone’s cell phone was recovered in the river’s South Cove, in the vicinity of Rackett Lane and Benson Lane, two small streets extending off Main Street in the downtown village. The search resumed Monday morning, and police recovered the body of a male around 10 a.m. The office of the Chief State Medical Examiner in Farmington is expected to perform an autopsy on the body. 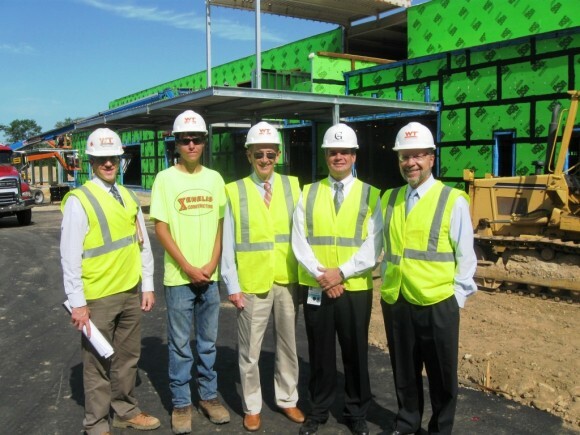 The management team directing the construction of new Westbrook medical center (l to r) Tim Know, Project Manager, Whiting-Turner Construction; Jack Xenelis, Xenelis Construction; Noel Bishop, Westbrook First Selectman; David Giuffrida, PE, Vice President, Middlesex Hospital; and Harry Evert, Senior Vice President of Strategy and Operations, Middlesex Hospital. There are now two emergency medical centers along the shoreline. One is the “grand daddy of them all,” the emergency medical center in Essex operated by Middlesex Hospital. This medical center has been serving emergency medical patients from its Essex location since 1975. The second emergency medical center on the shoreline is located in Guilford off I-95 at Exit 59. 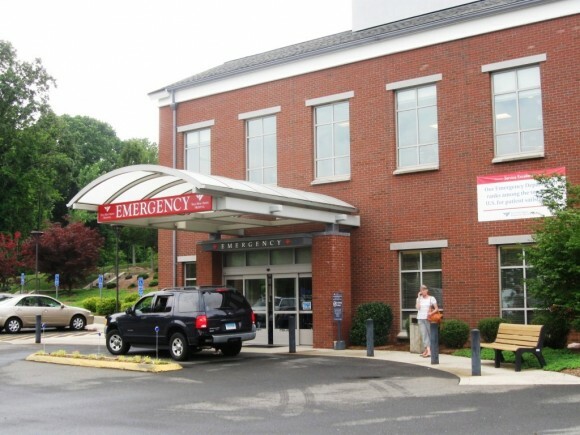 It is operated by Yale New Haven Hospital, and it opened in 2004. For decades the emergency medical center in Essex had the shoreline emergency medical center practice pretty much to itself. Patients from Old Lyme to as far as Branford, and all towns in between, had only one choice for emergency medical care, and that was in Essex. However, after the Guilford center opened in 2004, many Essex patients, especially those from the towns of Branford, Guilford, Madison, Clinton and Westbrook, had a new alternative. That was the Guilford medical center, which is just off I-95 at Exit 59. Certainly, it is quicker and easier for residents of these towns to go to the Guilford medical center along I-95 than to go to Essex, whose medical center is reachable only by a twisting local road, three miles down from I-95. However, Middlesex Hospital could see the handwriting on the wall. It soon realized that an emergency medical center located right off I-95 was bound to attract more emergency medical patients than one several miles away from the Interstate. So Middlesex Hospital, under the leadership of Executive Vice President Harry Evert, committed itself to building a new emergency medical center in Westbrook, just a short distance from Exit 65 off I-95. 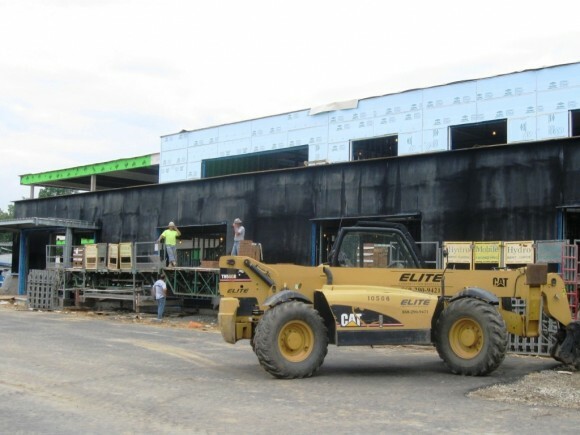 It is now being constructed on an expedited basis and is scheduled to open in April 2014. Although Middlesex Hospital’s new emergency medical center will not be located quite as close to I-95 as the Guilford medical center, there are attractive expansion possibilities at the largely vacant Westbrook site, which are a plus. Who Invented the Emergency Medical Center Concept? 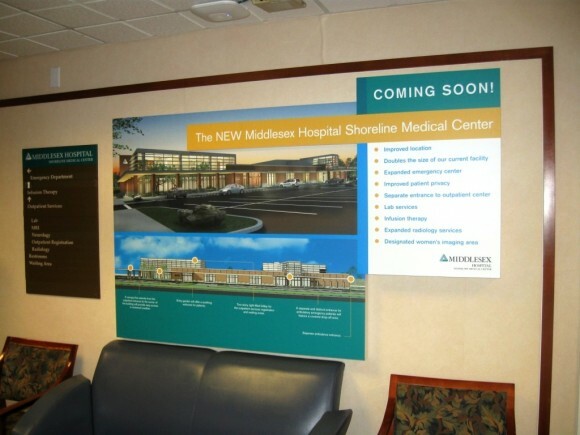 If you listen to Middlesex Hospital’s plain spoken, Executive Vice President Evert, it was Middlesex Hospital that first developed the idea of building an emergency medical center to serve shoreline communities away from the sponsoring hospital. Evert says, bluntly, referring to Yale New Haven Hospital’s emergency medical center in Guilford, “They were copying us.” True enough, Yale New Haven Hospital, by building an emergency medical center in Guilford, may well have been “copying” the success of Middlesex Hospital’s emergency medical center in Essex. However, it is equally true that Middlesex Hospital is now “copying” the concept of the Yale New Haven Hospital, which is to place its new emergency medical center close to an exit off I-95. Both the two hospitals, as well their shoreline patients, are the winners in this matter. In fact, the only real losers are the residents of Essex. They will soon lose having a major medical care facility right in town. Furthermore, Essex residents in the future could also lose local access to the physicians’ offices, Middlesex Hospital’s physical therapy center, and other hospital related facilities, which are now clustered around the Essex facility. Although some Essex residents decry the emergency center’s moving out of town, clearly, there is no turning back. The bottom line is that the shoreline will have by spring of next year two, 24 hour, seven days a week, emergency medical centers, and both will have easy access from I-95. CHESTER— The Organon Market on Route 154 will close for remodeling on Aug. 11, with its reopening depending on the approval of a revised special permit application from the planning and zoning commission. Market owner Peter Kehayias said Thursday he hopes the closing will be only temporary, giving him time to pursue an amended special permit application with the commission while also seeking advice and possibly other assistance from the state Department of Economic and Community Development. But Kehayias also acknowledged the market at 56 Middlesex Avenue, also known as Route 154, would probably never reopen if the commission does not approve some revisions to conditions the panel imposed when it approved a special permit for the market in September 2011. During the remodeling, Kehayias plans to submit a new application to the planning and zoning commission requesting changes to some of the conditions to the original special permit that was approved by the panel in September 2011. Kehayias said limited seating for customers and some easing to restrictions on signage are needed for the market to continue in operation. “”All of my customers are asking for seating,” he said, while adding the limits on signage prevent him from highlighting sales and specials that could attract additional customers. The market has generated strong opposition from some nearby property owners since it was first proposed in 2010. The nearby residents contend the market represents an improper expansion of a pre-existing, non-conforming commercial use in the surrounding residential zone, with some also claiming Kehayias hopes to expand the market in to a full-service restaurant. The building at 56 Middlesex Avenue was formerly a gasoline station, and most recently a bicycle repair shop, but had been vacant for several years before the market opened in July 2012. The group of nearby residents opposed the market during the initial public hearings in 2011, and also objected to an effort by Kehayias earlier this year to amend the special permit. Kehayias had requested amending the permit to allow up to 12 chairs or two benches inside the market for customers. While the requested revision drew support from some residents at a March public hearing, a divided planning and zoning commission denied the requested amendment on a 5-4 vote in April. Kehayias is an elected member of the commission, but has recused himself from participating in the panel’s review of his own business. In the latest development, a letter of complaint from six residents led Zoning Enforcement Officer Judy Brown to issue a cease and desist order to Keyhayias last month. Brown said this week the cease and desist order focused on exterior issues, including the location of trash containers, signage, and lighting. Kehayias said he hopes the application for permit revisions can be considered by the commission at a public hearing this fall, possibly in October. Kehayias said his employees, including six full-time workers and six part-time workers, would be laid off during what he hopes is a temporary closing.